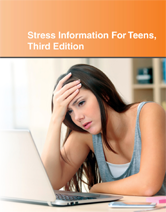 Stress Information For Teens, Third Edition helps readers understand what stress is, recognize the different types of stressors, and realize how stress affects the adolescent mind, body, and behavior. Common causes of teen stress are discussed, and diseases and disorders having possible stress components (including asthma, back pain, chronic fatigue, peptic ulcers, eczema, hair loss, and eating disorders) are explained. Chapter 1— What Is Stress?